A selection of Fire exit signs that are ideal for displaying around the workplace and in public buildings. 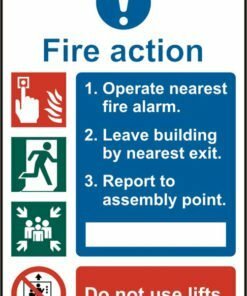 Our fire exist signs are part of our range of safety signs. They will help your company comply with health and safety legislation. The regulations state that an exit sign with an arrow must be used to direct staff, customers and visitors to the nearest escape route. Our signs could make the difference between life and death in an emergency. People will know instantly which way to go in order to reach a safe area in the event of a fire. We also have signs that show the fire action procedure. Our fire exit signs are made from rigid PVC or self adhesive vinyl. Available in a pack of five. Need any help with your order? Give us a call on 0330 0885 675 and we’ll be happy to assist.